The Combi TF-2 is a perfect solution for forming and gluing die cut trays. The TF-2 fast tray former is a simple, intelligent and very compact system that utilizes the same transport mechanism as our E-series case erectors. 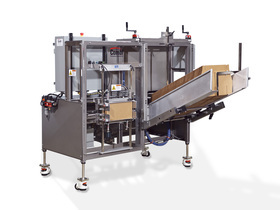 The TF-2 tray former machine features a low-profile, gravity walk-in case magazine that makes it very easy to load trays. Only 4 easy adjustments are required for fast tray changeovers. A computer controlled glue application system applies glue precisely to the tabs at measurable intervals, creating a very square and securely glued tray, every cycle.